Below, I've compiled a list of the most compatible Hackintosh bluetooth adapters-- every adapter on this list works in Mac OS X without the need for extra drivers or kext editing, and can wake any Hackintosh from sleep mode. Most of these adapters have a very wide price range; the actual price depends on where you buy the adapter from. 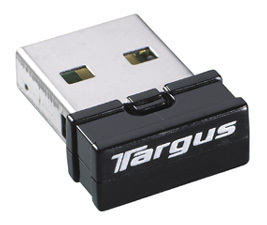 The Targus ACB10US is one of the smallest adapters on this list. To allow for this small size, it sacrifices range: though the ACB10US is technically rated for a broadcasting range of 30 feet, in reality, it barely manages a 10-feet range. If your computer is going to be more than 10 feet away from you at all times, this limited range will likely prove problematic. However, if your computer is located right next to your mouse and keyboard, you won't need to worry. The ACB10US comes in two versions: a first-generation model that's big and silver, and a second-generation model that's small and black (pictured to the left). Some people claim that the first-generation model is more reliable. However, that model has been discontinued, so you'll have to check eBay if you want to find one. The ACB10US works "out of the box" in Mac OS X, meaning that you don't need to install any extra drivers to get it working. You can wake OS X from sleep with the Apple wireless keyboard and Magic Mouse by default, though you can't wake OS X using the Magic Trackpad; you'll have to restart the trackpad every time. Still, everything works well overall-- the ACB10US was currently the bluetooth adapter of choice on tonymacx86's initial 2012 CustoMac recommendations. 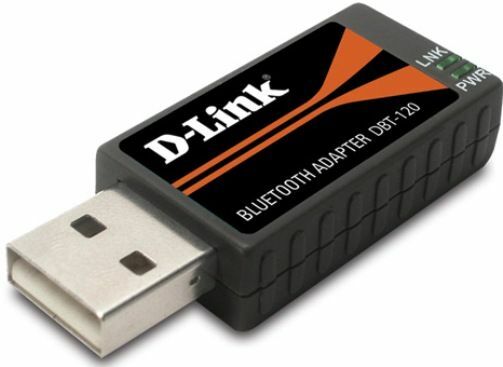 The D-Link DBT-120 is a very old model, but it has one of the best reputations of any Bluetooth adapter in the Hackintoshing community. Three years ago, this was the adapter to get for your Hackintosh. 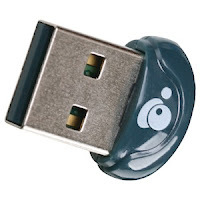 Nowadays, there are many other competitive alternatives in the market, but it's still a great choice if you want a reliable way to connect to your wireless accessories. The DBT-120 is no longer available from most retailers, but it's very cheap to buy used ones from third-party resellers on eBay. The DBT-120 is rather big, especially considering that it only has a range of about 10-15 feet. However, like in the case of the Targus ACB10US, whether this is an actual problem depends on how far your mouse and keyboard are from your computer. The DBT-120 won't be able to wake Mac OS X from sleep mode until you install this Apple bluetooth update (which works with all versions of OS X, despite only mentioning OS X 10.3.6). Otherwise, everything else works "out of the box" in Mac OS X. After all, the DBT-120 was originally recommended by Apple itself, as a third-party alternative to the built-in Bluetooth of the Mac Pro. NOTE: It's unconfirmed whether the DBT-120 can wake Mac OS X with the Magic Trackpad, though it's unlikely. 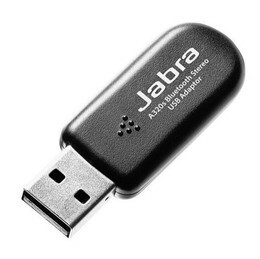 Unlike many of the other bluetooth adapters on this list, the Jabra A320S actually has a decent broadcasting range: with a tested range of about 20-25 feet, it's more than enough for just about any hardware setup. Now, the A320S isn't exactly small, but if size isn't an issue, it's a great choice for any Hackintosh. The main issue is its limited availability-- the A320S is relatively old in hardware terms, and it's usually only available from third-party resellers on eBay. Fortunately, it's very cheap. The A320S works in Mac OS X without the need for any extra drivers-- the adapter is able to wake Mac OS X from sleep mode by default, with both the Apple Magic Mouse and wireless keyboard. However, it still doesn't work quite perfectly with the Magic Trackpad; the trackpad can't wake OS X from sleep by itself, and it requires a restart every time you leave sleep mode. Overall, the A320S is a very reputable model-- it's the bluetooth adapter of choice from tonymacx86's 2011 CustoMac recommendations, and Lifehacker's guide to building a Hackintosh. The IOGEAR GBU521 is the newest model on this list, and probably the best choice of Bluetooth adapter for your Hackintosh right now. It works well and it's extremely small, but it doesn't necessarily sacrifice range for compactness-- the GBU521 can usually manage up to a 20-foot broadcasting range. However, some people have problems getting their GBU521 to even maintain a 5-foot range, so your mileage may vary. Also, thanks to its newness, the GBU521 is widely available on the internet for relatively low prices. The GBU521 works in OS X Mountain Lion 10.8 without the need for any extra drivers, and can wake Mac OS X from sleep mode by default with Apple's wireless keyboard, Magic Mouse, and Magic Trackpad. The trackpad occasionally encounters problems reconnecting after waking from sleep, but these seem to be the exception rather than the rule. Unfortunately, the GBU521 is so new that its compatibility only extends to Mountain Lion. The GBU521 isn't supported by default in other versions of Mac OS X-- it requires kext editing to work in Mac OS X Lion 10.7 and Snow Leopard 10.6. As of January 13, there are only four choices on this list. While there are many other Bluetooth adapters that can connect your Apple wireless accessories to a Hackintosh, most of them don't work with OS X's sleep mode. With this in consideration, these were the only four adapters I could find that were overwhelming confirmed as working "out of the box". So take your pick! And best of luck on your Hackintosh.